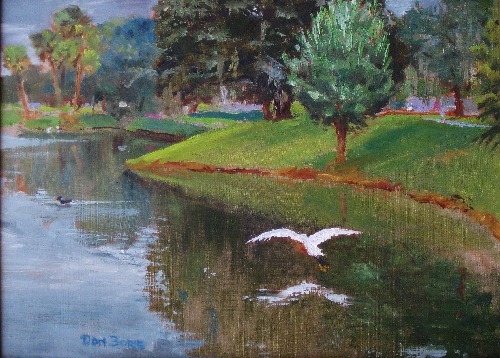 Artist Don Borie creates plein air paintings in oil and pastel. By focusing on light, shadow and contrast, he captures the drama and presence of the landscape. Visit his website to see more of his work. After a career in graphic design and illustration serving advertisers, I am fulfilling my deep desire to paint the subjects I choose. My favorite is plein air painting. Being outdoors in the fresh air on location provides a feel of immediacy—the stage is already set. The play of light on a chosen subject is most often the motivation for each painting. My interpretation of the scene becomes my style of art. Oil paints have become my medium of choice because of their buttery depth and good drying time. After I get an impression of the scene, I quickly draw a thumbnail sketch or study of how I want to portray this idea on canvas. Then, with intense observation, brush with selected color in hand, I begin developing this image on canvas. I call my style illustrative impressions because I wish to capture the spirit of the subject and still be realistic. Subjects that catch my eye can be anything from light on a tree trunk to a grand vista of mountain, only simplified. Water with its fluid nature of ripples, swirls, reflections, and transparency often pulls me in for a closer look. Outdoor painting can be overwhelming with so much to choose from, so it is important for the artist to focus on a page rather than the book. My current series of artwork is about the ever-changing stories of clouds. They are so different, from the drama and beauty of a warm sunrise coloring a puffy cumulus cloud, or a bright afternoon cloud backdrop for a soaring eagle, or a darkened water-ladened cloud framing the contrast of a bright, golden cloud. Sometimes, at night, lingering storm clouds produce sudden drama in cloud to cloud lightning flashes followed by thundering booms. Each day can develop a new skyward drama! For me, subject matter for art can spotlight an overlooked simple viewpoint. For example—sunlit wildflowers amongst shadowed surroundings can tell a story quite well or the grace of a gliding white egret over a calm pond reflects a peaceful surrounding. Contrast, mood, thought, power, and beauty can each or all be part of a strong piece of art. 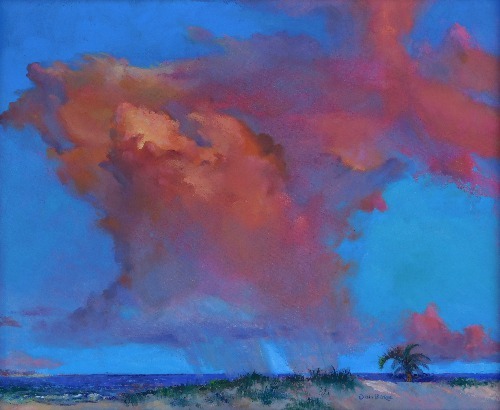 Artist Don Borie invites you to follow him on Facebook and Pinterest. Want to stay current on cutting edge business articles from Artsy Shark, plus artist features, and an invitation to the next Call for Artists? Click below to sign up for our twice-monthly email. You’ll get all this plus opportunities and special offers that you can’t get anywhere else! These are very gorgeous depictions of landscapes and scenery. Your landscapes are executed powerfully and dramatically. Congratulations on your amazing art. 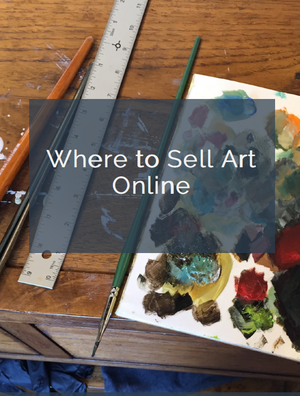 BECOME A SUBSCRIBER & GET OUR EBOOK ON SELLING ART FREE! Visit Artsy Shark’s profile on Pinterest.